Jennifer Too, when asked to introduce herself, says we probably know her mother Lillian. Indeed we do. The mother-and-daughter team operates the World of Feng Shui stores with Jennifer running the daily business as CEO. 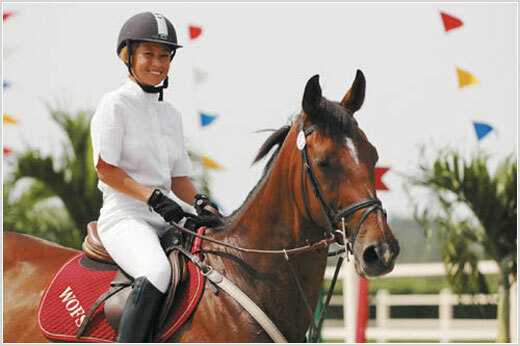 The public may not know she has one other passion - horse riding, and in particular, show-jumping. This week, we could watch Too, 28, compete in one of the most prestigious events in the equestrian world - the FEI World Cup Jumping Final 2006 which concludes on Sunday at the Putra Stadium in Bukit Jalil. She shares with SHARON KAM her love for horses, feng shui and, of course, her mother. When did your love for horses begin? In my spare time, my passion has always been riding. When I was three, my parents brought me to a place called Knoxberry in the United States where I went on a pony ride and after that I kept bugging my parents that "I want to ride, I want to ride," but it was not until I was nine before they let me ride. They got me my first horse when I was 11. The horse's name was Toby. He taught me a lot and we used to gallop in the fields, we were in England because I was in boarding school in the UK. You were in boarding school since you were 11 and you had a horse? Because I was homesick and I had a horse? (laughs) No, it was not quite like that but I really enjoyed school there because I had my horse and the school (authorities) were really understanding. I went to Benenden School and there was a teacher, Mrs Phelps, who also loved horses so she helped me find a pony to buy, for my parents to buy me. And on weekends I could ride my pony, so the school was really supportive. When I came back here, I saw the riding scene here had grown like so much and so far ahead, thanks to people like Peter Imran Winton and Wan Zaleha Radzi. (They were instrumental in bringing in the FEI World Cup Jumping Final). You started riding at age nine, where? Nine was before I got my own horse so it was just in the riding school in Hongkong because my mum was working there when I was young and after that at Bukit Kiara Equestrian and Country Resort and then at the Selangor Polo Riding Club. But even from age three you felt a special affinity to horses? I love horses. I think it is every little girl's dream to have her own horse and it's like one better than dogs, I mean I am also a dog-lover, I have two dogs at home, but horses ... they are not just like your pets, they're athletes where you can form a partnership like when you showjump, you achieve things, you don't achieve it just on your own. They are not like machines, like race cars. What characteristics of a horse do you like? So how did you get into show-jumping? When I was a kid, I used to do everything like dressage, cross-country, show-jumping and then as I grew up, I seem to like jumping better and show-jumping is a little bit safer than eventing (an equestrian event) like when you are galloping cross-country at speed and the fences don't come down while show-jumping is more about accuracy and slightly less dangerous. Any sport is not safe but show-jumping is relatively safe, I think. So it gives me all the thrill of jumping without the danger. I first started competing at 12 and that was when we travelled to Jakarta for an international borrowed horse event. Now everyone from the Southeast Asian region, they fly their horses everywhere but in those days, if it was an international show, you fly in and there is a pool of horses where you draw lots for and you have one session to get used to the horse. That was my first taste of international - flying out of Malaysia to ride for Malaysia kind of thing. I went with two other team members. You won a number of titles in your horse-riding career? When I was young I won a lot of stuff and I was very encouraged by that, like the Junior Open titles, National Horse Shows but now ... I stopped riding when I went to university because I did not have the time and my wonderful, wonderful horse called Just for Fun, he could not jump anymore because he had some condition so we retired him from jumping and because I did not have another horse, I gave up for about five years. And then when I came back after I graduated when I was 21-22, I picked it up again. Got myself another horse and that's when I kind of picked up where I left off. I guess it is every rider's aspiration to ride for the country, to win medals for their country and so maybe one day ... I am not there yet but just to be able to participate in this show (the FEI World Cup) is wonderful. It gives you an opportunity to compete with the rest of Asia (she is competing in the Asian category) and riding in the same show as some of the top riders in the world. I want to be a really good rider. Riding is a real passion for me. You stopped for five years. It is a long time, isn't it? Ya, if I have not stopped, maybe I would be even better now but you know, I guess you can never give up but keep going, so I did not let that stop me. I have a long way to go. I mean people like Qabil, Syed Omar - our national champions, they really set good standards for us to follow. They are an inspiration to riders like me. I studied economics in Cambridge in the UK. I wanted to join the polo club there and all but because of studies and I was too busy with university life ... When I graduated, I realised that I really did love horses. It is like my number one passion in life so I couldn't stay away. After five years you realised that? You know I watched Gladiators and I saw Russell Crowe on his white steed and I said 'I missed that!'. What animal zodiac are you? Oh, I am a snake actually. Snakes and horses go together? Snakes and horses get along. The horse is the snake's peach blossom animal. That means, If you put horses in the south corner, it brings you a lot of luck and love, like romantic love. That's why my mum always jokes that because we have a lot of horses in the house, I was getting marriage proposals when I was 16 (laughs). I ended up marrying a really nice guy, Chris. So your career is in feng shui? Emm, well, I've always known feng shui since I was a kid because my mum has always been very interested in it and then she started writing books on it and became famous. When I first came back I had my own company building websites for other companies and one of them was to promote my mum's work and also World of Feng Shui. Then two years after, Tan Sri Vincent Tan at MOL bought a share into our company and that was what allowed us to grow and so I think it was being at the right place at the right time and it was like a natural step to carry on what my mum built up. What is it like being Lillian Too's daughter? Oh, it's great! I guess it is no different from being anyone else's daughter except she is the best mum that you can have. She always inspires me and she always supports me without pushing me. I mean if I want to do something, she will support me and she is always like on my side, like if someone is against me, she will side me, so she makes me feel like I can do anything. Well, people do ask me things like that because she is famous but to me, she is my mum. Is there no pressure to live up to her popularity and success? Well, she is very charismatic and she is a wonderful writer, speaker and she has a big personality but she always says I should be my own person. I can be like her, I can go into feng shui like her but I don't have to be Lillian Too the Second. I am Jennifer. But people do compare, you know. Ya, people do compare. We had a birthday party for her 60th birthday recently and then we did a skit for her where I acted the young Lillian and then we beamed up pictures of my mum when she was like my age and people were like saying "oh, you two look alike!" (laughs). You look alike, but personality-wise? I think we are quite different. She's louder than me. She is (a) more explosive, gregarious personality. Me, I am carefree, fun-loving, I don't think I am as kind of go-for-it as her... sometimes maybe I should be but then, I'm me. But she allows you to be yourself. Ya, she says you can be a wonderful person no matter what kind of person you are so you shouldn't aspire to be someone that you are not but to be the best that you are, yourself. Do you have an ambition, aspirations? Make lots of money so I can ride more (laughs). I think to be a good person, to be able to do something of my life and not just one aspect of my life. I have my career, I have my family, I have a kid - Jack, and I have my riding. So these are my passions and to be able to balance them and make something of them. I think to lead a meaningful life where I can make a difference in life and to other people's lives, I guess to be a good person and if I can (have) all the trimmings at the same time, then that's like all the icing, you know. Would you consider yourself a feng shui master? Master is quite a big title. I would say I know a lot about feng shui. I can consult in feng shui, I can write books on feng shui but Master is maybe the wrong word. We are not into calling feng shui masters but we can say we are authorities on feng shui. Would you want to follow in your mother's footsteps? Well, I think it would be a shame to lose it because I am so lucky to be in this position to learn such a great skill from her ... so to not want to take up that knowledge is, I think, really dumb, like a waste because hundreds of people out there want to learn from her and I have the best opportunity to learn from her and do the best that I can. What does you husband do? He is an architect and he is also very good in feng shui because since meeting me, he has been hanging out with my mum and learning from her too. And because he is an architect, it is like a perfect match because he knows what can and can't be done. The recommendations he makes to his clients are very do-able. About this show-jumping. Do you use elements of feng shui to ensure you do well? Oh, I am very particular about that. I have my lucky colours and then my flying star feng shui (a dimension of feng shui), you see every month the stars change position, so this month is not actually supposed to be so great for me, for my animal sign snake because there is too much earth energy and illness energy in my sector. So to overcome that, because the illness star is an earth star, I have to wear white - metal. So I will be dressed in white shirt, white pants on the jumping day, so it is like a protector. So I take that into account when I train like when there is an important jumping session, I wear white. What about for your horse? For my horse, for competitions, I usually put on the maroon and gold numnah (saddle pad that goes under the saddle). Red and gold is always a good combination and that is why our World of Feng Shui shop is covered in red and gold. Like Chinese New Year everyone puts up red and gold because it is very yang. Red is like the ultimate yang colour and gold is well, like gold. Does your mother ride too? She rides for fun and exercise. It is such a healthy hobby. My dad also. So we ride in the mornings at Kiara and we have our morning meetings on horseback. My mum is non-executive chairman of World of Feng Shui and I am the CEO. I run the business on a day-to-day basis but she does not have to come into the office everyday so we usually have meetings while on horseback. She is the adviser, the main brain and strategist in the company. I see you a lot on TV. Oh ya, on the Lillian Too show. And your mum is like so natural. She is SO natural, for me it is a bit harder. We were shooting everyday, a few sessions a day so the first session will always be oooh ... stage fright! And then I'll warm up and then get better so when you watch the series, I am always better every three or four episodes later because that is the end of the day but then the next day comes and hah, start all over again. But once you warm up to the audience, then they help you as well because we have a fantastic audience. What made you decide to join your mum on her show? There are comments that your mum outshines you all the way on the TV show. It's ok. She's my mum. I mean, it is better that she outshines me than I outshine her. I think it is fine. I think I'll get there. I'll get better. I mean I am not like great on TV yet but I think I am getting better. We don't have a script for the show. So it is all like ad hoc. Before the show, we discuss and say this is what we are going to talk about and then we will go up. It is my mum's style. She talks off the cuff and that is why she is such a good speaker. But for me, it is like 'I need a script. Mummy, mummy, you have to tell me what you are going to say so I can ...' you know. Do you feel any pressure at all being her daughter? No, not at all. Maybe, maybe I wish I could be as good on TV or as good at speaking as my mum but then the comparison will always be there. Me and my mum, we are very close. You are a TV personality, you are also a show-jumper and you are a feng shui expert. What else are you into? I love music. I think it would be really fun to have music as a profession. I play the piano, I wished I played better, I have to practise. My son's going to pick up piano, the guitar, the drums ... We are big music fans and we love karaoke. I love everything about music. At the moment, I really like Queen and other rock bands, not heavy metal but melodious rock. And you want him to play the piano, the guitar ...? Ya, he should. I mean he should have all the opportunities. I mean that was the philosophy my parents brought me up with - to let me try everything. When I was growing up, I learnt piano, harp, flute, guitar, violin but I liked the piano so I carried that on. But you know how to play the rest. I can play basics but I am best at piano. Nowadays everyone is bringing up their children like that so you want to give your child the best opportunities as well. Are animals or pets important for a person's well-being? Well, pets make very good energisers for the home. Dogs especially, they are very lively, they bring yang energy into the home, so especially when you can't be at home all day, it is good to have a dog there to make sure their energy never stagnates. From a feng shui point of view, it is important for children to grow up with pets so they learn to care for another being, that is how they learn to love when they care for their own pet. So dogs are probably the best pets to keep. Horses as well. Ya, they are very expensive. Actually all my money goes towards horses. In our family we have five, two of them are mine. Jet is my top competition horse and there is another one which I also compete. The other three are my parents'. I have been competing almost every weekend leading up to this show but these are training shows. I try to compete as much as I can. This is one of the biggest shows I've ridden. To be in the same warm-up arena as some of the greats like Ludger Beerbaum, Marcus Ehning and Michael Whitaker - all these top, top show-jumpers, I mean, how many people get to do that. We are so lucky because if you are part of the riding community and if you have that chance, it opens up a whole new world. Even back in Europe, you don't get to see these riders everyday. We are not riding in the same class, but we still get to meet them and learn from them. I have a coach who is a top rider in New Zealand who is coming up to help me, her name is Leanne Chambers. I also have a local coach who is based at Bukit Kiara so he helps me but she is like a top rider so when she comes she can just fine-tune. She is a good friend, we've known her for like nearly 15-20 years now. She was the one who found me my first competitive horse - Just For Fun, I was telling you about, the one that was winning all the junior titles. We got him when he was nine and he stayed with us until he was 20 something. He was the most gorgeous horse ever, and now Jet is just as gorgeous. Do you think you would turn professional? I think not, because it is very difficult. If you are a professional rider, you would need to have a lot of money backing you. Either you are really good and you can convince big companies to sponsor you or you are very rich yourself or you come from a rich family so I think I have to make my millions first before I can do that (laughs). I can make a lot of money, retire and then become professional. I am sure you can. See how, we have big plans ... how we can make RM20 million by the time I am 35. What is this about World of Feng Shui that is so popular? I think it is of course Lillian Too's internationally well-known name but we built it into a brand where we give people, we sell them hope and luck - basically our shop is a luck shop. We are an honorable company which makes sure that our number one priority is that it helps the customers, give them good service and it works. So I think if we have that in mind, and not just trying to make lots of money for yourself but you want to help other people as well, that grows people's faith in the brand. Is the renewed interest in feng shui just a passing fad? I think feng shui is here to stay. It's been a fad for the last 10-20 years. I think it first came up in the early 90s and it's lasted this long so I think it is just gonna keep growing... maybe not as fast as when the world first found out about it but now because it has worked for so many people, I think it is not gonna just die. A lot of people do not believe in it and consider it a superstition. What do you say to these people? If they don't believe, there is no harm in trying it. Try it because feng shui is not something that you have to believe in for it to work. It is very scientific, and if they bother to learn and go deeper into it, they will realise that it is not just mumbo-jumbo but there is a method to it, there are formulas and if they are interested, just try it, if it does not work, it does not work. If it works, better for them, right?